The story is about an aging stage star (Davis) who fights to keep her position as a younger actress (Baxter) moves up the ladder in the NY theatrical jungle. Joseph L. Mankiewicz (who also won the Oscar for direction and the Screenplay Oscar). With Marilyn Monroe, Gary Merrill, Hugh Marlowe, and Gregory Ratoff. Joseph L. Mankiewicz received the Screenplay Oscar. While Edith Head and Charles LeMaire was awarded the Oscar for B&W Costume Design. 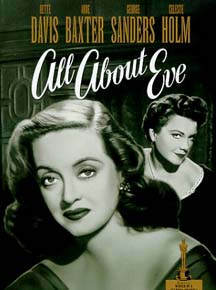 ALL ABOUT EVE also got the Oscar for Best Sound Recording. It was based on a short story, "The Wisdom of Eve", by Mary Orr. Some say (but denied by all) the story was based on Tallulah Bankhead. Bette Davis met her fourth husband, actor Gary Merrill, during the filming of this film.